George Toman made a few upgrades to an HO scale Milwaukee ribbed-side box car kit. Click on any image here to review a larger size. Here’s George with his work. Like many readers, I’ve been inspired by Bill Welch’s work here on the RCW blog and have rolled up my shirt sleeves to upgrade a plastic model. 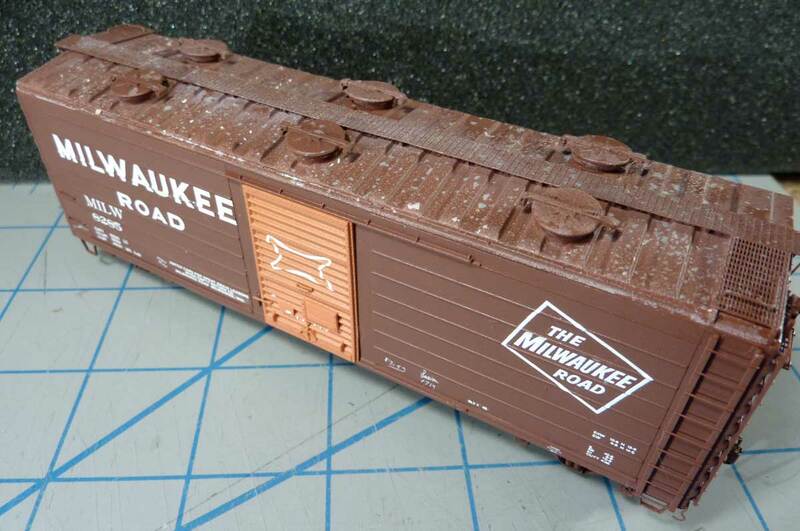 I worked to correct the side channel height and to increase the height for the sides of a Milwaukee ribbed-side box car. 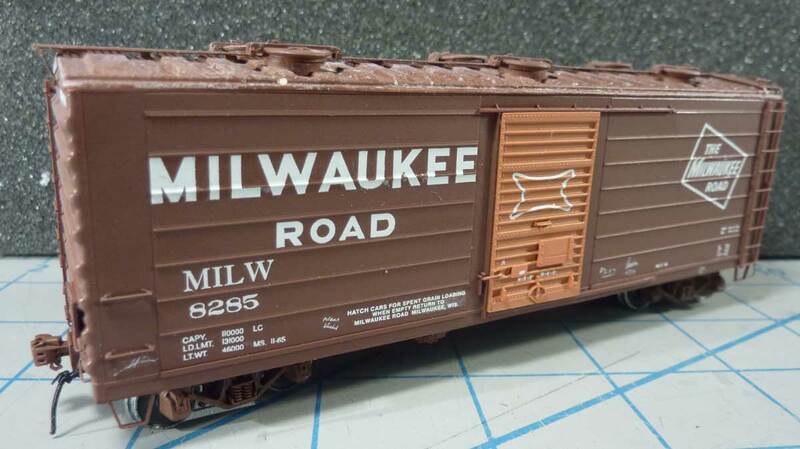 The model also features Stan Rydarowicz resin replacement roof, hatches and decals. The starting point for this upgrade is a Rib Side Cars kit. As a first step, the underside injection mold marks were removed from the car body shell, along with the coupler boxes and cast on brake wheel housing. The underframe was modified by gluing 0.010 x 0.050-inch styrene to the crossties as well as the main frame to give a more prototypical appearance. Components from a Tichy Westinghouse AB brake set were installed along with a scratchbuilt Royal F Type Slack Adjuster. 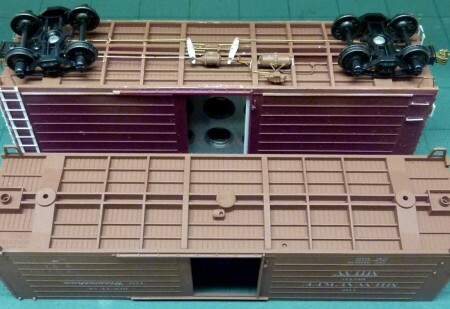 Details and photos from Railroad Prototype Cyclopedia, Volume 13, were instrumental in completing these details. All underframe piping was installed by comparing prototype photos and drawings. Brass wire was formed for brake rods and air lines while brake levers were made from styrene. I used a similar method to Bill Welch in constructing the side ladders with 0.020 x 0.030-inch stiles and 0.010-inch rungs. The sill steps were also made as Bill did, but I thinned the material using a file. 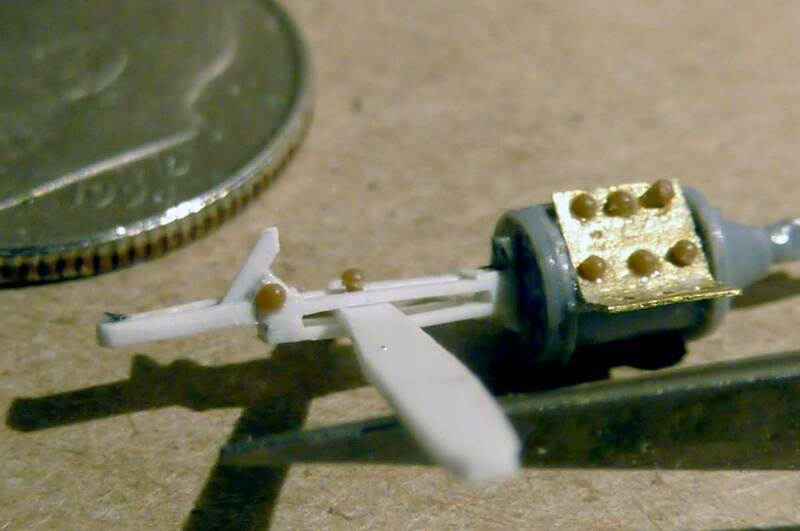 Small pieces of styrene and harvested rivets were installed along with scratchbuilt tack boards, as per Bill’s “Xxtreme Modeling” presentation at the St. Louis RPM meet. 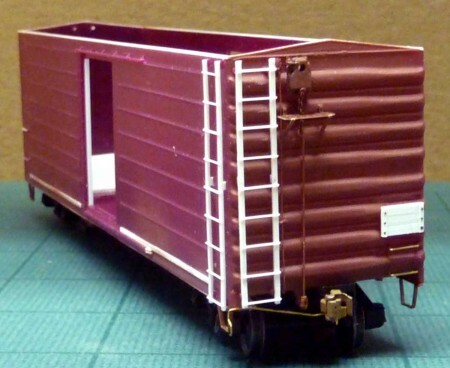 A spare set of doors from an InterMountain ribbed-side box car kit were used, as they seem accurate for this upgrade. Door handles were carefully shaved off and new hardware was fabricated from 0.008 x 0.018-inch brass stock. A Yarmouth Model Works etched brass Apex running board was installed, along with Sergent scale couplers and Accurail scale draft gear. The model was painted with Model Masters Oxide Red with the doors painted Milwaukee Orange. The roof was painted Aluminum. After the paint was dry water was misted over the roof, salt was sprinkled onto it, and the roof was painted Oxide Red. After drying for about two hours, I carefully removed the salt with a small brush and water. 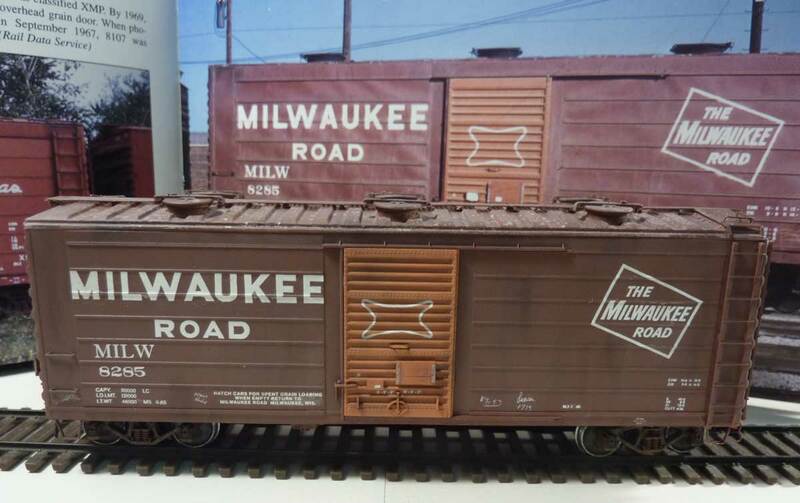 This was a technique that Ted Culotta featured in the recent Prototype Railroad Profile, Volume 2, that focuses on modeling the Milwaukee ribbed-side box car prototypes. A gloss coat was applied before the Stan Rydarowicz decals were installed. Additional decal bits from Speedwitch and Sunshine were also used. After the decals were set, a dull coat was applied. Additional weathering will be done soon. I plan to build Sunshine Models kits of the 40- and 50-foot ribbed-side cars. Similar details will be installed, but the Rib Side kits offered a great opportunity to work out these techniques on a less expensive model. I may try to create a file and 3D print the Royal F Type Slack Adjuster. These are just a few tasks on my lengthy project list. I’m happy to have completed this Milwaukee car and apply a few new techniques. 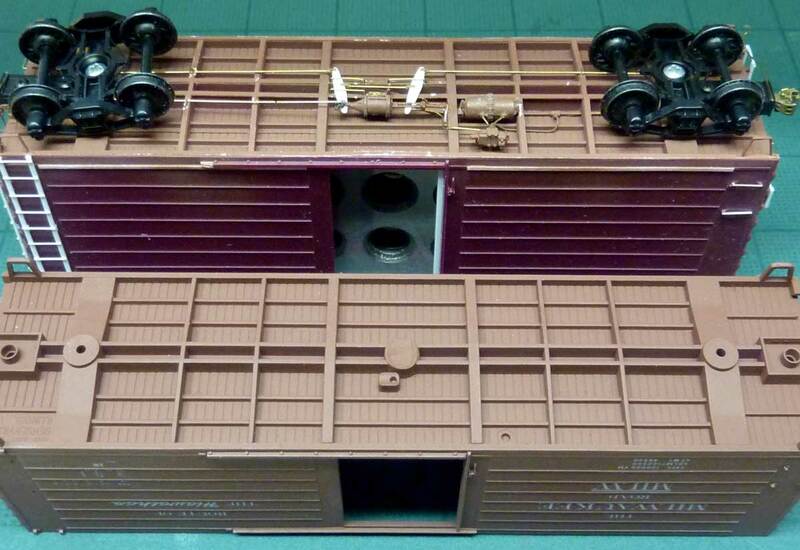 Thanks to George Toman for sharing some very nice work in upgrading a plastic box car kit. George’s work is a fine tribute to Stan Rydarowicz. I’m sure Stan would have been tickled to see his parts and decals featured here on the blog. We will miss his smile and enthusiasm at Railroad Prototype Modeler meets. Thanks for visiting the RCW blog. Questions and comments can be posted below. Please follow the instructions so your comment can be posted. All comments are reviewed and approved before they appear. What year were these cars introduced? That is indeed a Miller Beer Logo. These cars were assigned to the Miller Brewery and used for spent grain. The Miller Logo made them easy to spot. I am happy that Stan made the special roof and decals to make a very unique car. What a great way to memorialize and remember Stan. Nicely done George. The white outline on the door seems reminiscent of the Miller Beer logo (hope I am remembering correctly). Is there a connection? These cars were built to haul spent grain from Miller Breweries to feed animal feed processors and others for use in their industries.